This week I had the opportunity to be the opening keynote speaker at the annual conference of the Missouri Chapter of the American Planning Association. My time slot was threatened by a little sporting event taking place right now in St. Louis (Go Cardinals! ), but I finished up before first pitch and all went well. The highlight of the trip -- besides touring the St. Louis neighborhoods, which was amazing -- was getting to meet Mitchell Silver (Twitter), the national president of the APA. Here is a man with a vision for how to reform the planning profession. It is the exact message that is needed right now. If you get a chance to hear him speak, take the opportunity. There is some hope for APA if the members would elect someone like this. I'm astounded by the wide range of people that we reach here. I recently came across a blog called The meaning of things that is written by Chris Fair and Dianna Carr, a pair of strategic marketing consultants. They write about "what resonates in a changing world" and they were so kind as to put a link to Strong Towns at the top of their blogroll. You can follow them on Twitter and Facebook. If you are in need of some strategic marketing assistance, they certainly seem worth a look. I've asked Justin (of podcast fame - he does the intro and exit) to write a blog piece on this article he sent me about one of my home towns here in Minnesota and their efforts to add Costco to their big box collection. There is so much there (and it is just too easy) but my favorite part was their argument over the theoretical pedestrian. Do we build sidewalks or not? I know some of you will say yes, but I've added a map after the quote showing the area roughly a half mile (walking distance) from the site. Lack of sidewalks-to-nowhere is the least of problems that Baxter has. 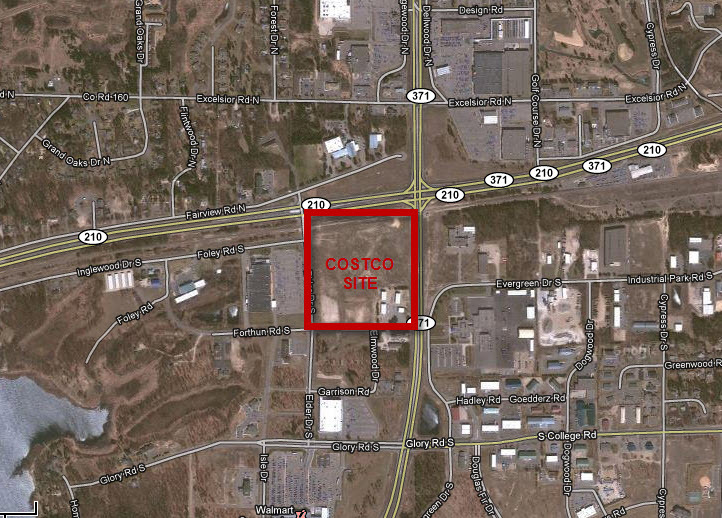 Pedestrian movement, not actively included in Costco’s plan, was recommended by consultants with sidewalks around the development and to access the expected fast food restaurants to Costco’s north. Marked crosswalks were suggested at Elder Drive at Forthun Road, Costco’s main access and at Foley Road. The city of Edmonton has done some really great work using financial analysis to promote a more efficient pattern of development and an end to subsidies for the decentralized, auto-based approach. David Thompson of the Edmonton Journal wrote an excellent piece on their progress. In the first 30 years, service delivery and operations and maintenance - at nearly $2.5 billion - greatly outweigh capital and renewal costs put together. Later on, renewal and replacement of aging infrastructure will climb steeply, hitting $142 million per year, every year. Out of Seattle, Mark Hinshaw took a look at the changes taking place inside planning departments since the beginning of the housing correction. His optimistic viewpoint is that this reset is prompting communities to rethink their approach. I hope that's true, but see Baxter/Costco above for some signs that at least some places will be brought kicking and screaming into the New Economy. If we learned anything from the past five years it is that the American ideal of home ownership has been cruelly oversold. At least 5 million people had no business trying to purchase a home. Once bankruptcies, foreclosures, and underwater loans have run their course, that number will surely be even higher. Yet people still have to live somewhere. And in fact, the first wave of new development financing is for rental housing, not owner housing. The challenge for local governments will be to ensure that these places are livable. Another fascinating new direction is that many elected official are now seeing the value of making long-term investments in “public goods” — those parts of a community that have a life well beyond the amortization periods of private sector development. They see the importance of making good places rather than simply issuing permits. Ord, Nebraska is now my favorite county in the nation. The Daily Yonder reported how they got sick of waiting for their federal and state handouts -- the help we all "need" -- and instead decided to take control of their own future. They added a 1% sales tax dedicated solely to economic development and, reportedly, are doing very well. If a poor, rural county in Nebraska can do it, what excuse do the rest of us have? After finishing Michael Lewis' new book Boomerang, where wrote extensively about California's problems, I got a chuckle out of this NBC article out of L.A. explaining how sewer rates could double. Oh, they'll double alright -- in L.A. and everywhere else -- but that won't come near to solving any problems. Over the past 20 years, the city has kept customer rates mostly flat, borrowing to fund improvements and emergency repairs. It receives more than $1 billion in federal clean-water grants to help cover the rising cost of infrastructure repairs to sewers and water treatment plants. Porchfest. A beautiful idea that is so fantastic it is sad that it needs to be an idea (instead of something that just is on an ongoing basis). Thank you to our good friends at Project for Public Spaces for picking up on Nate's recent piece on walking/biking to school. And thank you to our old friend Jake Krohn as well as a site called MoveArkansas for spreading my TED talk around. It has not been watched over 5,000 times, which is impressive until you stop to think that our Conversation with an Engineer video has been watch more than 119,000. Not bad for two computer bears talking about a street project. Speaking of videos and engineers, did we need more proof that the engineering profession is insane than this video of the "diverging diamond". If we had infinite resources (we don't), this would still be crazy, but the fact that we're broke just shows you how insulated from reality so many of them are. Hey, engineers -- watch my TED talk on the difference between a ROAD and a STREET. You're trying to rid yourself of accident-prone left turns? Well, how about just build ROADS where there is no need for left turns and STREETS where they are no problem, instead of the STROADS you build today. I'm not joking. This weekend my family and I get to live like kings and queens. Hope your time is just as wonderful.